If anyone is into this kind of thing (whoring out your skills for a lazy non-knitter being the thing I refer to), I'd like to commission a piece. 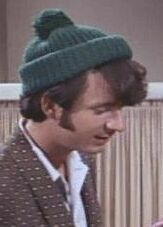 I would like very much to have a green winter hat like the one that Mike Nesmith wore around back when he was a Monkee. 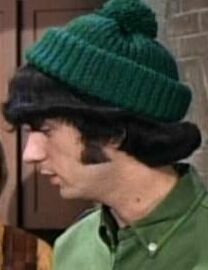 Shockingly, I have scoured the web (by scour I mean look at the first two pages of google searches such as "green knit hat monkees" and "monkees mike hat" for about 15 minutes) and have come up with nary a pattern. Nor is there a comparable hat on Ebay, just when I think that you should eschew Alice's Restaurant because the place you really can get anything you want is Ebay. Lies. 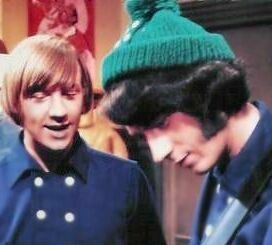 Here, here, here, and here are some pictures of knit hats that Mike wore. You can see that one of them had a little panel with buttons - which would be utterly fantastic. It will need to be long enough, however, to at least cover the tops of my ears (and really, hopefull most of my ears) thus actually staying on my head. Preferred yarn: cotton or cotton blend. Wool makes me itchy. I have no idea if hats are even feasible in cotton. I guess it has to be stretchy somehow? Let me know if anyone, anyone at all out there thinks this would be a fun project and would accept cash and materials to do it. I forgot to mention this sermon I found while seeking hat patterns. I was with him on Matthew 6:19 but after that things get a little uh, vehement for me. mike's green hat! squeeee (and other fangirlishness)! if anyone comes up with one for you, i have to see it, really kim, i do. now i'm hearing his voice in my head, just talking. what fun. I can't stop singing "I think I will travel to Rio... using the music for flight..." since I started looking around for this... :) I am SURE if someone actually agrees to do this, I will be posting pictures. If you like the idea of the project then yay! Oho, it looks like my roommate will be able to do me the favor. That doesn't mean we couldn't meet in DC sometime! I have no idea when but if you are metroing and so am I, it would be easy to do. Wouldn't you just prefer a 20' knit scarf? This is a perfectly reasonable request. 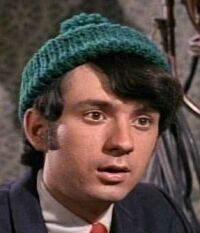 Who wouldn't want to dress like Mike Nesmith? Given how much research you've done with nary a result, I applaud anyone with the skills to help you. I must confess - your icon squicks me out! Er, to explain, I am one of those feminists that modern feminists think are tedious and prudish, and I am unnerved by images of women that objectify, particularly when those images "fit" into the mainstream image of women. You don't strike me as the kind of guy to objectify women or hate on women or whatever turn of phrase, but for some reason I am incapable of not commenting on these media images no matter what context I find them in. Er, what I mean is, I'm sorry if I sound like a jerk!! You don't sound like a jerk at all but more a woman of conviction. That's cool. Dude, simple. Let me finish Secret Project and I'm on it. I don't know how /functional/ I can make the buttons, but then, I think they're mainly there for decoration anyway. We could go to a craft store sometime and you could pick out the yarn, because I think that will get you the result you're happiest with. Fantastic - this will happen soon. By the way, did you know that there's a little yarn shop in the building on Main St Laurel that Red Hot and Blue is in?! I had no idea. I would try to do that for you but I have yet to master the art of the Pom. Surely the Pom is only the next step after tassels? It is! But the one I tried to make was miserable. Clearly I just need more pom practice. While you're talking Nesmith, I am reminded that I need to ask you if you have ever seen "Elephant Parts" or the short-lived "Television Parts?" If yes to either, does anyone you know know of where to get copies of same, preferably on digital compact discs? If no, you really must. Fo cheezit. I suspect that the "television parts companion" is not nearly complete, so instead of ordering it I am asking my dad for the xth-generation dubbed VHS tapes of the shows themselves. Elephant Parts though is being ordered asap. How I love the internet. What would really rock is if the xth-gen vhs tapes had the original commercials on them. commercials from the 80s crack me up every time. Some of them may, but my dad was fairly vigilant (in fact sometimes too much so) about pausing the tape when commercials came on. It is unfortunate, since I too am an enthusiast of watching vintage commercials. I was obsessed with the Monkees, and that was bad, because I should have been obsessed with Jesus! Why, yes, I would like some more thorazine, Nurse Ratched. If only Jesus had a catchy theme song and lived in a group house with his buddies...and played the tamborine. Hey, two out of three ain't so bad!